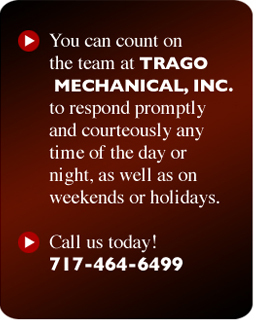 You can count on the team at Trago Mechanical, Inc. to respond promptly and courteously any time of the day or night, as well as on weekends or holidays. No one knows when the equipment you depend on can fail. We will be there for you with a smile and expert repair. Contact us by phone, fax or email. For after hour or emergency calls, contact the main phone number and follow the prompts. A technician will contact you soon after.